The record of James (Eddy) Eaddy was first established in South Carolina about 1753 when he petitioned for a grant of land. This petition is found in Council Journal No. 21, pt. 1, pp. 148-149. "Read the petition of James Edie Humbly setting forth that the petitioner is desirous of settling on the waters of Lynches Creek and having a wife and two children for whom not yet for himself has any land been assigned him, and therefore he humbly prays his Excellency and their honors to order the surveyor general to run out to the petitioner 200 acres of land on the waters of Lynches Creek as aforesaid and that he may have a grant for the same and the petitioner as is duty bound shall ever pray." "Char town the 2d day of Janu. 1753. James Edie. The Petition being considered and the Petitr appearing and swearing to the truth of his said Family Right the prayer thereof was granted and the Depy. Survy. ordered to prepare a warrant and the Surv. General to runout the 200 acres mentioned that_________ a grant may______to the Petitr for the same." In Colonial South Carolina, land was granted under various laws and statutes as decreed by the King of England and/or the Lords Proprietors. Any free person could appear before the Council and petition for a survey to be granted land. The amount of land awarded depended upon a head of family status which at one time was valued at 100 acres for the head of household and 50 acres for all others of the household including slaves. This amount changed periodically depending upon the desire of the government to attract settlers to the colony. After the petition for a survey was submitted, the person appeared before the Council and petitioned for a grant to pass which authorized the surveyor to measure out the land. The Lord's Proprietors were British nobles who were loyal to King Charles, II. of England and assisted him to return from exile and regain his throne. To reward them for their contributions, on March 24, 1663, the King gave them ownership of a large tract of land in the colonies. This was a very large segment of North America running from the Atlantic to the Pacific, lying between 36 degrees north latitude on the north and 31 degrees on the south. In 1665, the charter was amended to raise the north line 30 minutes and extend the south line by two degrees. 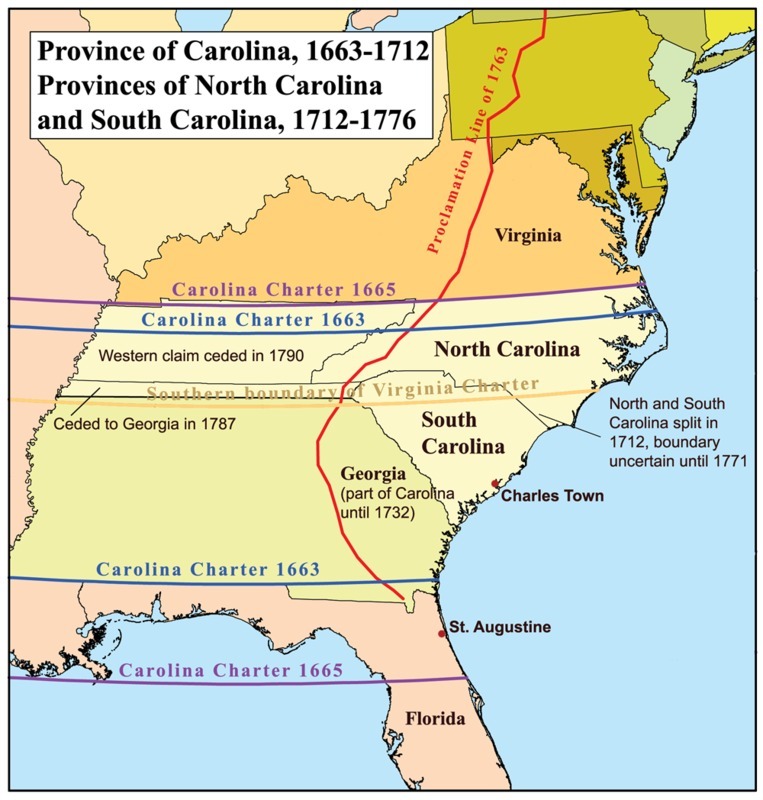 Their claim, which was called Carolina, then included the part of North America that now includes the states of North Carolina, South Carolina, Georgia, Tennessee, Alabama, Mississippi, Louisiana, Arkansas, a small part of Missouri, most of Oklahoma, Texas, New Mexico and Arizona, the southern half of California, the southern tip of Nevada, the northern part of Florida, and a part of northern Mexico. This huge section of continent was granted entirely to eight men, to be financed by them for their profit, and to rule with the help or interference of any local government as they might permit. The Lords Proprietors were: the Duke of Albemarle, Lord Ashley, Lord Berkeley, Sir William Berkeley, Sir George Carteret, the Earl of Clarendon, Sir John Colleton, and Lord Craven. It was their names which were given to the early counties, districts, and which continue even now as names of counties and places. The most important of these was Lord Ashley (Anthony Ashley Cooper), who laid out the street plan for the new city of Charles Town, South Carolina. His secretary was the philosopher John Locke who wrote the Fundamental Constitution of Carolina. In 1719, the Lords Proprietors gave up their claims to property in the Colony. This probably occurred because they failed to understand the value of their possessions which they found could not be managed well from so great a distance. Arrangements were finally made to return the Colony to the King of England in 1731. The land records were left in great confusion as a result of their withdrawal and lack of control of changes made during the interim. To determine ownership, an act was passed in 1731 called "The Memorials". This required land owners to file a brief statement of their ownership, known as a memorial. "Plats, Vol. 6 p. 296. Precept 2 June 1753. James Eadie, 200 acres on one of the branches of Lynches Creek, Craven County, south side of creek. Bounded on all sides by vacant land. Certified 2 Feb. 1753. John Liviston, Deputy Surveyor. Entered 23 April 1753. (Reference to loose plats, folder 516)"
"Vol. 14, p 537. Precept 5 June 1770. James Edy. 100 acres, Craven County, Long Branch, waters of Lynches. Southside bounded by vacant land. Samuel James, D. S."
James (Eddy) Eaddy I entered the Revolutionary War with his two sons, James (Eddy) Eaddy II and Samuel (Eddy) Eaddy Sr. James Eaddy I was reported to be an old man of about 45 years of age upon entry. They fought with General Francis Marion who was a "guerilla fighter" along the SC low country rivers, creeks, and swamps. They would form up in nearly inaccessible swamps, attack the British, and disappear. It is uncertain whether they participated in the capture of Jacob Bartell, a Hession solder who fought with the British. Family legends have indicated that he rode a large black horse which broke in a bridge over a creek or river. This was alleged to be Black Mingo Creek, now in Georgetown County. He would not leave his horse and was captured by the Americans. We know that he chose to remain in America after the war. He became a close friend of the Eaddy family and lived in what is now Marion County, across the Lynches River from the Eaddy homestead. His Revolutionary War record can be found in conjunction with that of his son, James Eady (Eaddy, II.) in Revolutionary War Records, Archives, Columbia, South Carolina, (AA 2130): "In March, 1784, Mr. James Eady for account of supplies to the Army in 1781. SE F 449". This was endorsed as "Rec'd 7 Jan. 1785 by order of James Eady Senior received by Nath. McCants." There is also a record of receipt to James Eady Senior for beef and supplies provided to the Southern Army commanded by Major General Green. An endorsement was made in the Charleston District for supplies to the Francis Marion Brigade. This account was attested to before______(illegible) by James Eddy, Jr. (Eaddy, II.) in (AA 2131). James Eady Sr. (Eaddy, I.) and (var. sp.) Mr. James Eady, Jr. (Eaddy, II.) gave indents for provisions supplied for militia duty as noted in SE F 448 and endorsed by Josiah Cockfield. It is recorded that James Eddy, Sr. (Eaddy, I) and James Eddy, Jr. (Eaddy II.) gave authority to Josiah Cockfield to collect, indent. This was for service in the militia in Marion's Brigade and was dated in 1786. The two above documents (2130 and 2131) provide records for both James (Eady/Eddy) Eaddy, Senior. and James (Eady/Eddy) Eaddy, Junior. At this time, the terms Sr. and Jr. did not necessarily denote the relationship of father and son. They were suffixes used to distinguish two people of different ages with the same name living in the same area, who could be of any or no relationship. The documents cited here indicate that James (Eady/Eddy) Eaddy II. was the son of James (Eady/Eddy) Eaddy, I. JAMES EDDY LAND GRANT PETITION ABOUT 1730. The location and date of birth for James Eddy is uncertain; but, some evidence exits that he was probably an Englishman who was born about 1710. James Eddy boarded a ship in Liverpool, England sometime about 1728-30. The ship ran aground in a hurricane upon arrival in Charleston, SC. James survived with a few other passengers by clinging to the ship's wreckage and swimming ashore. He petitioned, about 1730 for land in which he claimed the loss of two children and his wife. The name of his wife and children alleged to have been lost in the storm are unknown; but may be listed on the ship's manifest which allegedly reported James Eddy as English. This may refer to citizenship or location of boarding rather than ethnic origin. It has been determined that a hurricane "of great violence" struck the south side of Charleston on the evening of August 15, 1728, severely damaged 23 vessels riding in the harbor, and killed some people. This could be the hurricane cited in the land petition which caused the loss of Eaddy's family. This grant petition was related to Vanik S. Eaddy by Kenneth M. Eaddy. Kenneth indicated that his Aunt Lillian Eaddy had visited in South Carolina with her Eaddy relatives and had observed this document. The original of this petition is supposedly located in an historical records depository in Charleston or Columbia, SC; but, it could not be located when a search was made in 1997. This James Eddy could be the father of James Eddy, I., a relative, or a non-relative. Further research is needed to determine these facts. "An order drawn up by Captain Elias Horry in favor of Mr. James Eddy amounting to the sum of five Pounds for provisions supplied the Militia in the late alarm." The alarm was a minor squabble with the Spanish in Florida. Also on page 334, on March 30, 1743 there was issued "
...a certificate in favor of James Eddy for victualing men by Elias Horry...for five Pounds. This is interesting because, if this is our senior James Eaddy, this would place him in South Carolina a full decade before Elaine Eaddy's earliest record of him in The Promised Land... It is also interesting that our ancestor furnished the same sort of service to Francis Marion in the Revolution, a slightly more serious "alarm." Betty Jean Sanders, Charleston, South Carolina. He was born about 1730 and died between 1790-1800, having been counted in the 1790; but, not found alive in the 1800 Census. We cannot be certain of his national origin nor ethnic heritage; but, this author has concluded that he was an Englishman who could have been born in England or possibly in the colonies. No conclusive evidence can be found at this time to document these assertions. The date of his birth will need to be adjusted if documentation can be produced to corroborate the 1728-30 land grant petition which cites the shipwreck arrival in America about 1728 of a man named James Eddy. There is also another documented presence in Carolina of a man named James Eady/Eddy who provided supplies valued at five pounds to the Militia. Additional research is needed to confirm or deny an association with these three persons. A plausible theory is that James Eddy of the 1728 shipwreck is one and the same as James Eddy who provided supplies to the Militia in 1743. If this is a true hypothesis, there might also be evidence to prove that he was the father of the man we know as James Eddy (Eaddy I) who was born in America rather than England. The reader is cautioned to examine these assertions and challenged to determine whether this be true. This family changed its surname from EDDY to EADDY sometime between 1819 and 1848. Samuel appeared with his brother, James (Eaddy) Eddy II in the Jury Lists, Prince Frederick's Parish for the period 1778-1791. It is also suggested that Samuel (Eddy) Eaddy Sr. was a Revolutionary War soldier who served with his brother James (Eaddy) Eddy, II. and possibly with his father, James (Eddy) Eaddy, I. in the Francis Marion Brigade.